#AceFinanceNews – Disney has offered to invest at least $1 billion dollars to makeover its Disneyland resort if the city of Anaheim will extend their gate tax exemption. Chip Yost reports from Anaheim for the KTLA 5 News at 1 on July 7, 2015. #AceFinanceNews – #BRICS July.07: There has been a significant change in Russia’s political course after relations between Russia and the West deteriorated. Vladimir Putin is now actively intensifying partnerships with Beijing and other #BRICS partners, especially in the context of the New Development Bank (NDB), Die Tageszeitung wrote. Since the beginning of the Ukrainian crisis, Russia has changed its political course towards major emerging economies and investing money into promising projects considered as alternatives to Washington-dominated institutions. This particularly concerns the NDB, a project developed by the #BRICS countries to create competition for the World Bank dominated by the US and the IMF. Russia approved an investment of $200 billion in the new project. Russian leadership also ratified a number of documents on the establishment of the bank and now expects that its other four partners will follow its example.The new bank may participate in financing the construction of the “Silk Road”, a project initiated by China to revive the ancient trade route which would connect Asia with Europe. According to the China’s Xinhua state news agency, Russia is planning to shift the center of economic development to the Far East and the Asian region. The source referred to an interview with Russian Deputy Prime Minister Yuri Trutnev, in which he called China “Russia’s leading partner”. 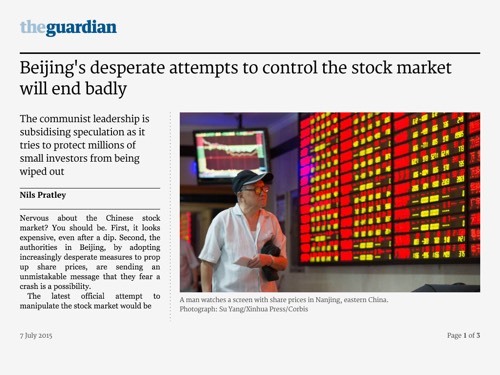 #AceMarketsNews – SHANGHAI (Reuters) – July.07: Chinese stocks fell sharply on Tuesday, taking no comfort from a slew of support measures unleashed by Beijing in recent days, and unnerved by Chinese Premier Li Keqiang’s failure to mention the market chaos in a statement on the economy. Before the market opened, Li said in comments posted on a government website that China had the confidence and ability to deal with challenges faced by its economy, but had nothing to say on the three-week plunge that has knocked around 30 percent off Chinese shares since mid-June. The ChiNext growth board, home to some of China’s giddiest small-cap valuations, fell 5.1 percent. Qi Yifeng, analyst at consultancy CEBM, said government measures were not strong enough to reverse the downtrend, especially as it was a liquidity issue for many who had borrowed to buy shares and were now forced to sell to meet margin calls. “It’s just a matter of whether it will fall more slowly, or continue to slump in freefall,” he said. Global investors have grown increasingly concerned about China’s volatile stock markets, fearing a full-blown crash could destabilise the world’s second-biggest economy. In an attempt to arrest the sell-off, China has arranged a curb on new share issues and orchestrated brokerages and fund managers to promise to buy at least 120 billion yuan of stocks, helped by China’s state-backed margin finance company, which in turn has a direct line of liquidity from the central bank. The official Shanghai Securities News reported on Tuesday that China’s major insurance firms ploughed tens of billions of yuan into blue-chip exchange-traded funds (ETF) and large caps on Monday. China Life Insurance Co Ltd bought a net 10 billion yuan ($1.6 billion) in index funds, while China Pacific Insurance Group and other insurers each invested more than 1 billion yuan, the newspaper said. That helped the indexes rise just over 2 percent on Monday, but the relief was shortlived. Unlike other major stock markets, which are dominated by professional money managers, retail investors account for around 85 percent of trading in China, a factor that contributes to the stomach-churning volatility of Chinese equities. Traders are increasingly nervous about the unusually large number of Chinese companies asking for their shares to be suspended from trading, fearing that many of them are looking for excuses to duck out of the market turmoil. About a quarter of the roughly 2,800 companies listed in Shanghai and Shenzhen had filed for a trading halt by the close on Monday, and on Tuesday the Securities Times said another 200 had announced a suspension. Investors were also reacting to news of tightened restrictions on futures trading on a major small-cap index. The rapid decline of China’s previously booming stock market, which had more than doubled in the year to mid-June, is a major headache for President Xi Jinping and China’s top leaders, who are already struggling to avert a sharper economic slowdown. China’s bullish securities regulators admitted that markets had become too frothy before they turned down, but the slide quickly showed signs of getting out of hand. A surprise interest-rate cut by the central bank at the end of June, relaxations in margin trading and other “stability measures” did little to calm investors. 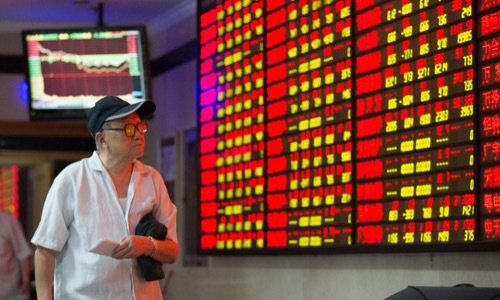 Underlining scepticism beyond mainland China about the sustainability of the new measures, Hong Kong listed shares of Chinese brokerages took a beating on Monday. Lei Mao, assistant professor of finance at Warwick Business School, said government measures to support the market distorted the allocation of funds and trading behaviour and could create the conditions for further sharp falls. “Even an optimistic investor should not participate in the market for now,” he said.